The point of all this is to make very clear how much I value my money, and how much I distrust magazine content. When it’s not fluff, it’s filler, and when it’s not filler, it’s advertising. But when I heard that Coilhouse Magazine were offering their entire 5-issue back catalogue as a PDF download for $20, I sat up a little straighter in my chair. You see, despite having never read anything of Coilhouse, and having only interacted with the three editor/founders tangentially via twitter and the Whitechapel forums, the concept of an art/design/culture magazine dedicated not just to the underground but the fringes of the underground set off little sparks in my head. The covers of each issue looked like William Gibson novels that never quite made it into print. The thumbnail previews were beautiful and intricate. So I threw down my cash, and downloaded the magazines (which took a fair while – 5 PDFs, up to 70 meg each, on a piddly Australian connection. These are seriously shiny, hi-res productions), and quickly fell in love. 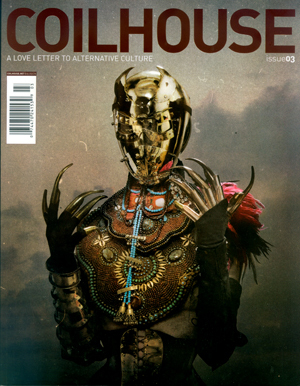 Coilhouse Magazine is, in the publisher’s own words, a love letter to alternative culture. It’s not an exaggeration. The founders of Coilhouse – Nadya Lev, Zoetica Ebb, Meredith Yayanos, and creative director Courtney Riot, along with all their contributing artists and writers – are elbow-deep in the world of alternative music, sculpture, television and literature. They have their grubby paws in so many different fascinating pies that there’s always something new to discover. I mean, look at this content. That’s just issue 5. Interviews with brilliant authors, alternative fashion designers, sculptors, musicians and artists. Excerpts from upcoming scifi novels. An article about the first nuclear tests, and the culture of atomic fear that followed. Goth/punk photography. Cyberpunk and transhumanist tech. Some of my favourite articles? A massive interview with author genius Grant Morrison in issue 4. Or was it the just-as-brilliant interview with BSG creator Ron Moore in issue 3? Zoetica’s gorgeous full-page illustrations? Jessica Joslin’s terrifyingly beautiful bone-and-brass sculptures in ish 1? Don’t make me choose, for the love of God. The design and layout of the mag itself is also exemplary. You won’t find basic three-column text here – every page is slick and stylish, with elegant typography and full-page spreads given over to the most beautiful photographs. Just take a squiz at any of these previews. Scrumptious! Sure, there’s a lot in Coilhouse that doesn’t interest me. Zoetica’s fashion shoots, for example. I never studied fashion and I’m still the kind of guy who wears a single pair of jeans until there’s more hole than denim, and so the fashion sections of Coilhouse (while admittedly really pretty, affordable and beautifully shot) just don’t click in my hindbrain. But that doesn’t matter, because there’s such a breadth of content in each mag that there’s something that will resonate with everyone of a creative bent. I’ve been inviting customers to read Coilhouse over my shoulder all day, and there’s always something that makes each and every one of them explode. I think I’ve figured out why this is. When I was eleven years old, living in Vienna, I saved and spent almost all my money on PC ZONE magazine. Every month I’d take the bus down six stops to a little magazine-stall and buy my fat, glossy magazine, complete with demo CD. I’d savour every page. This was a pilgrimage. Hell, at the time I didn’t even have a computer capable of playing the games reviewed in the magazine, but I bought it anyway. You see, it was ’96, and the internet was still a manky basement full of spiders and hobo corpses, delivered at a 56k trickle. The best way to get my vidjergame fix was still through print, and that meant that every issue of PC ZONE was a treasure-chest of rumours and industry gossip. Every month, I tore open the shrink-wrap on a tome of delicious secrets. Now, of course, there’s nothing you can find in a magazine that you can’t find faster online. Gaming news, photography magazines, American Artist, even the brilliant ImagineFX… name any speciality magazine, and I’ll name you a site that has all the same content, for free, with less hassles. Buying a magazine isn’t an act of discovery anymore. It’s just a gloss-print rehash of things we already knew. But Coilhouse is different. The writers and artists have pushed beyond the easy subjects, the obvious artists. Every story in every issue is unexpected. Leafing through each issue (as much as one can leaf through a .pdf) is akin to opening a dusty chest in an attic and finding heirlooms of imagined families, stacks of polaroids taken at a concert now only spoken of in apocryphal terms, futures that never were. Reading Coilhouse makes me feel like a kid again. Everything is new and fresh and razor-edged. The thing is, the editors at Coilhouse are dedicated to the idea of a print magazine, something tangible and beautiful, a mag that makes use of the medium. A print magazine is expensive. As spectacular as these past five issues have been, there won’t be an issue six without reader support. So that $20-for-five-issue deal I mentioned earlier? It’s not just a quick revenue earner. It’s a lifeline. So, if you love alternative culture, science fiction, bizarre sculpture, fashion photography, underground music… throw down your cash and fill your head with the unexpected. The deal only runs until April 21st. Be a part of something unique.